For many children, back to school shopping is a bittersweet experience: picking out fresh school supplies and brand-new clothes for the upcoming year can be exciting, even though it means an end to vacation. But for children who must return to school in old hand-me-downs or shoes with gaping holes, it can be a stressful experience. That’s where Operation School Bell® (with the help of school counselors) steps in. A national organization, Operation School Bell operates locally under Assistance League of Stockton, an organization that improves the lives of children in need through literacy, cultural, and basic-needs programs. Operation School Bell, which has been locally in action since 1989, is arguably one of their most important programs, as it provides schoolchildren in need with what many people take for granted – brand new clothing. Counselors at schools throughout Stockton, upon recognizing that a student is in need, will reach out to Operation School Bell with their list of kindergarten through fifth grade students who need assistance. From there, the volunteers put together the care packages. “We clothe children with a sweatshirt, a jacket, a pair of khaki pants, and two polo shirts,” explains Nancy Caplin, co-chairman of the local Operation School Bell. With sizes all the way up to twenty, they can clothe any size. “We also give them 6 pairs of underwear, 8 pairs of socks, and a gift card to Payless Shoes.” In addition to all these wonderful amenities, children also receive a grooming kit, as well as a stuffed animal and a book. 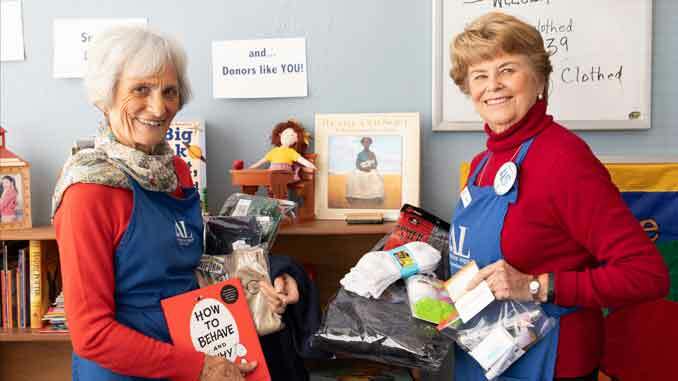 For many years, Operation School Bell operated out of the back room of the Assistance League’s thrift shop, but in 2009, a former beauty shop located at 1525 N. Sierra Nevada Avenue was converted to Operation School Bell’s new home. “We have wonderful people who supply merchandise, and we’re very proud of the percentage of our thrift shop sales that go directly to this project,” adds co-chairman Jermaine Case. While Operation School Bell used to be able to give the children their goods themselves, it’s no longer a practical option to bring them to the actual location. Now, counselors come in, pick up the bags, and then distribute them at the schools.